Understanding how much future spending, or consumption, an investor’s savings can support is critical in planning for retirement. As we discussed in part 1, the S&P STRIDE Index Series can help by providing a framework for estimating the annual income stream available in retirement using the concept of the Generalized Retirement Income Liability or “GRIL” (see part 1 for further details about the GRIL). Another integral factor in planning for retirement is selecting the right investment solution. An investment solution integrated with the goal of retirement income should focus on reducing volatility in the ratio of account balance to cost of income, which reduces uncertainty in the income estimate. From an investment strategy standpoint, that implies designing a solution that tracks the cost of income so that our account balance moves in tandem with it. This type of strategy is called a liability-driven investment, or LDI,[i] and has long been used by defined benefit plans to align their assets with their liabilities. As we explained in part 1, the two primary risks which impact account balance and the cost of income are interest rates and inflation. The S&P STRIDE Index Series are designed around retirement dates in five-year increments from 2005 (current retirees) through 2060. Each index includes an LDI component—inflation-protected fixed income securities with an average duration[ii] matching the expected timing of the retirement cash flows for that specific retirement period. This approach provides more comprehensive management of the risks that add uncertainty about future income. As Exhibit 2 shows, the LDI strategy dramatically reduces the volatility in estimated income compared to intermediate bonds and T-bills (which often constitute the risk management assets in retirement-focused investment solutions). The S&P STRIDE LDI component is designed to approximate the sensitivity of the cost of income to interest rates and inflation, so even as the account balance changes, the estimated retirement income is steady over time. In contrast, the values of the shorter-term bonds – represented by the US Aggregate Bond Index and the one-month T-bills – are less sensitive than the cost of income to interest rates and inflation. Even though the account balance changes less over time with those investments, the estimated income is more volatile because the account balance is not moving in tandem with the cost of income. Successful retirement planning means more than just saving and must take into account the decumulation phase. [iii] Doing so effectively requires information about how much an investor’s savings can provide in terms of retirement income. Obtaining relevant information about this goal is best accomplished using a framework that integrates the investment solution with the risks that produce uncertainty in translating account balances into estimated future income. The S&P STRIDE Indices provide a measure of the cost of income, the GRIL, and allow for the calculation of how much retirement income can be generated from a given level of savings. Using this measure, we can then create an investment strategy that reduces retirement income uncertainty to help investors better plan for retirement and pursue better retirement outcomes. [i] A liability-driven investment (LDI) strategy is designed to focus on assets that match future liabilities. LDI strategies contain certain risks that prospective investors should evaluate and understand prior to making a decision to invest. These risks may include, but are not limited to, interest rate risk, counterparty risk, liquidity risk and leverage risk. [ii] Duration is a measurement of the sensitivity of the price of a fixed income investment to changes in interest rates. Generally, high-duration bonds will have greater sensitivity to changing interest rates than lower-duration bonds. [iii] The decumulation phase refers to the period after retirement, where retirees draw down on or ‘decumulate’ their retirement savings. The S&P STRIDE Glide Path 2020 Index (the “Index”) was launched on January 11, 2016. All information presented prior to the Index launch date is backtested. Backtested performance is not actual performance, but is hypothetical and is generally prepared with the benefit of hindsight. Backtested information reflects the application of the Index methodology and selection of Index constituents in hindsight. No hypothetical record can completely account for the impact of financial risk in actual trading. For example, there are numerous factors related to the equities, fixed income, or commodities markets in general that cannot be, and have not been, accounted for in the preparation of the Index information set forth, all of which can affect actual performance. The backtest calculations are based on the same methodology that was in effect when the Index was officially launched. Complete index methodology details are available at www.spdji.com. It is not possible to invest directly in an index. The S&P Shift to Retirement Income and Decumulation (STRIDE) Index Series comprises 12 multi-asset class indices, each corresponding to a particular target retirement date. The asset allocation for each index in the series is based on a predetermined life-cycle glide path. Each index reflects a multi-asset class solution, with varying levels of exposure to equities, nominal fixed income securities, and inflation-adjusted bonds. The S&P STRIDE Index Series represents a strategy that builds a portfolio of assets to support a hedged stream of inflation-adjusted retirement income. The indices also provide a new framework for benchmarking target date funds (TDFs) that focus on delivering similar results. The indices are individually composed of asset class indices (an index of indices), and the index series includes target date years in five-year increments (vintages). Each index vintage covers a full life cycle of accumulation (during what are generally considered working years) and decumulation in retirement years. Beginning 20 years before each target date, the indices gradually re-allocate some of their weight from accumulation constituents to inflation-adjusted income constituents. This process is analogous to dollar cost averaging into income-producing assets. The income portion consists of a duration-hedged combination of Treasury Inflation Protection Securities (TIPS) indices. The duration of the combined TIPS indices is matched monthly to the duration of a hypothetical retirement income cash flow stream that begins at the target date and lasts for 25 years. The S&P STRIDE 2020 LDI Component represents the component of the S&P STRIDE Glide Path 2020 Index, which is the income-risk management allocation—made up of underlying S&P TIPS indices held to the same proportions as the S&P STRIDE Glide Path 2020 Index. 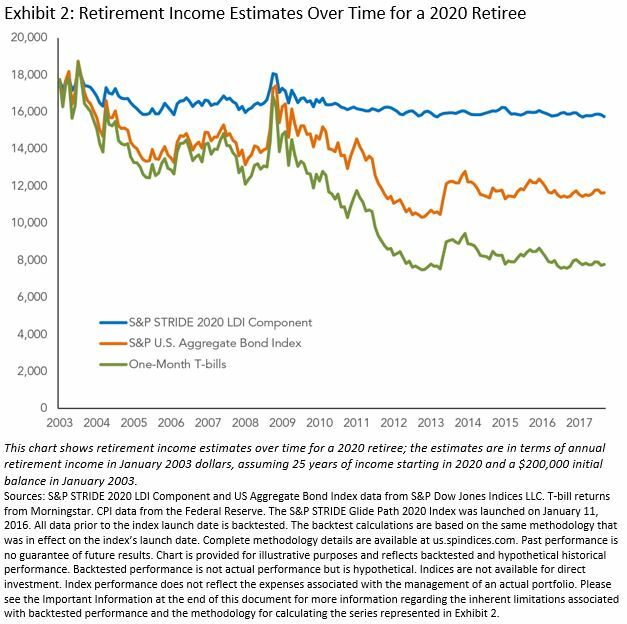 Exhibit 2 shows retirement income estimates over time for a 2020 retiree; the estimates are in terms of annual retirement income in January 2003 dollars, assuming 25 years of income starting in 2020 and a $200,000 initial balance in January 2003. The income estimates are shown for three different investment strategies, represented by the S&P STRIDE LDI Component, S&P US Aggregate Bond Index, and one-month T-bills. Income estimates are calculated by dividing the account balance (including the initial $200,000 and investment returns) by the GRIL at a particular point in time for a particular investment strategy, and then adjusting back to January 2003 dollars using CPI. For example, to calculate the income estimate for January 2010 under the S&P STRIDE LDI Component strategy, we first calculate that the beginning balance of $200,000 would have hypothetically grown to $315,550 by January 2010. The GRIL in January 2010 was 16.0127, so by dividing the hypothetically grown balance by the GRIL, we calculate an estimated annual retirement income stream starting in 2020 of $19,706 for 25 years. Using the CPI to adjust this back to January 2003 dollars, this amounts to an estimated annual retirement income stream starting in 2020 of $16,524.41 for 25 years. The S&P STRIDE INDEX is a product of S&P Dow Jones Indices LLC or its affiliates (“SPDJI”) and has been licensed for use by Dimensional Fund Advisors LP (“Dimensional”). Standard & Poor’s® and S&P® are registered trademarks of Standard & Poor’s Financial Services LLC (“S&P”); Dow Jones® is a registered trademark of Dow Jones Trademark Holdings LLC (“Dow Jones”); these trademarks have been licensed for use by SPDJI and sublicensed for certain purposes by Dimensional. Dimensional’s products, as defined by Dimensional from time to time, are not sponsored, endorsed, sold, or promoted by SPDJI, S&P, Dow Jones, or their respective affiliates, and none of such parties make any representation regarding the advisability of investing in such products nor do they have any liability for any errors, omissions, or interruptions of the S&P STRIDE Index. Dimensional Fund Advisors LP receives compensation from S&P Dow Jones Indices in connection with licensing rights to the S&P STRIDE Indices. It is not possible to invest in an index.